It somewhat resembles a Happy Meal box from the 80’s, albeit super-sized. I’m just glad they labeled the caption so I would know why it was there. quite bright out for night – is it the north pole? That’s not explanatory at all! The person that did this went undiscovered, as it happened in the only town in America whose police station had no one on staff at night. Not so sure about that. It looks like Random Fist is on the job. And as we all know, Random Fist’s real name is Thing. By day, he’s the hand servant to the wealthy Adam’s family. But, come sundown he’s HANDsome police detective, Random Fist. That’s two hand jobs in 24 hours. Eww. Why is it all… wet? The Eric’s right. It’s really more descriptive than explanatory. Perhaps instead it should have been labeled “Redundant Caption” so the people following the story by looking at the pictures would know they could skip it. Also? 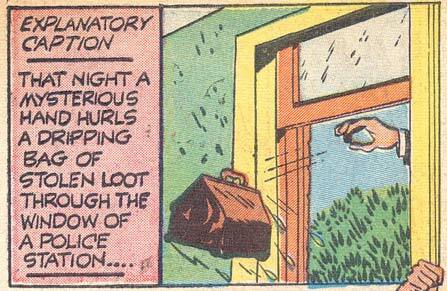 That’s quite an angle for hurling a bag full of loot through a window. You’d expect more of an underhand toss. He’s returning stolen fish I guess?